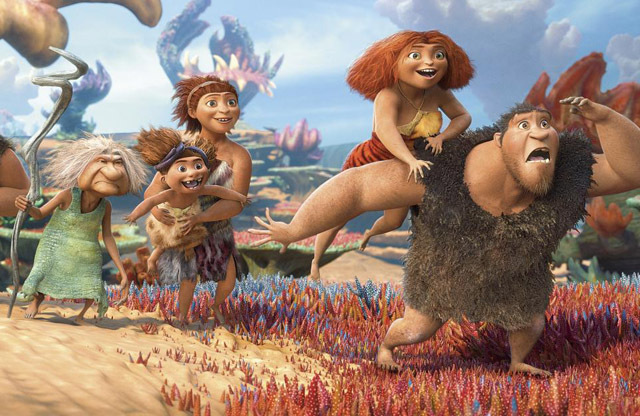 First, “The Croods” are goofy, a stone age family that consists of the loony dad, the doting Mom, the crass mother-in-law, the saucy daughter, the hapless son and the feral, animal-like baby (the typical family unit). It bases itself on a theme, believe it or not, which moves it from the good-to-great realm. It is about enlightenment, the old “thinking outside the box.” How do we as a civilization move forward anyway? With that type of thinking. How it is symbolized, and how it is realized? Through the use of light. The light of the sun, the new light of fire and the need to move towards that illumination for the next phase. It is almost ethereal, until of course someone gets smacked in the noggin yet remains unhurt. Oh yeah, it’s a cartoon. Grug (the voice of Nicolas Cage) is the father/protector of a large brood in prehistoric times. Most of his responsibilities – Ugga the Mother (Catherine Keener), Thunk the Son (Clark Duke) and mother-in-law Gran (Cloris Leachman) – follow his law of survival, which is to remain fearful at all times. And everyone abides by that law except for Eep (Emma Stone) who longs to follow the light of the sun. Enter a nomad named Guy (Ryan Reynolds). He not only follows his own rules but reinvents them through his “thinking,” a radical new concept. Eep immediately falls for him, and his mysterious companion, the light and heat called fire. Grug is skeptical and of course fearful of these new developments, but as the land around them literally starts to crumble, the Croods family will have to risk a brave new world.